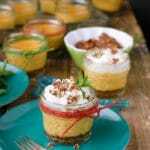 As an alternative for to a full pie, these mini Pumpkin Pie Cheesecakes in Mason jelly jars provide a light, tangy version of the beloved traditional pie in moderate servings. May be made the day prior and served at room temperature or chilled. If traveling for Thanksgiving, simply add Mason jar lids and bring them along. In a medium mixing bowl, add the ginger snap crumbs, 1 tablespoon of the granulated sugar and the melted butter; stir to fully combine. In the bowl of a freestanding mixer, beat together the cream cheese, mascarpone cheese, pumpkin puree, remaining sugar (3 tablespoons each granulated and brown sugar) and pumpkin pie spice until smooth. Add the eggs, one at a time; beat on medium-high until incorporated and the mixture is fluffly and light. Beat in the vanilla extract. Add the cheese mixture evenly to the jelly jars, filling to the lowest outer glass ring (approximately 1/2 inches from the top of the jar; refer to photos). Place jars in a 13 x 9 inch baking pan. Fill the pan with boiling water until the water level reaches halfway up the outside of the jelly jars. Place in preheated oven and bake for 30 minutes. Remove mini cheesecakes from the pan and allow to cool to room temperature on a cooling rack. They may be served chilled or at room temperature.